updateThe version of X-LR available on this site now includes some minor improvements since the initial version 1.40.0 was released. If you want to take advantage of these, download the plugin again and install it. Or just wait until I trigger the automatic update process for the next full version. 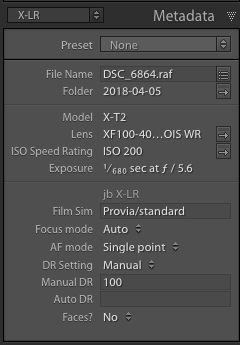 As well as English, X-LR supports Italian, German and French, but I would appreciate help with Lightroom’s other languages – I have Spanish, Swedish, Dutch and Portuguese ready. Email me if you feel like translating about 20 pieces of text in return for a free licence. With my X-T3 files and the latest iteration of Lightroom Classic CC, Lightroom provides v2 of all of the Fuji profile but X-LR is currently applying an older version of the Fuji profile. Short term you can create presets for them v2 profiles. But do you want to let me have a couple of sample files and I’ll provide a proper solution. I now have some sample files and see the issue. I am working on it…. I would like to collaborate on the Spanish translation of this plugin. When reading the Fuji rating from the RAF file in RAF+JPG setting, please also apply the same rating to the JPG file in case it is among the selected files for processing (it should have the same filename apart from the extension and also both the RAF and JPG file will have the same MakerNotes / ImageCount – matching this which make sure the correct files are updated).